Body parts are soothed with the massaging action of the PDC Spa hydrotherapy system. Tense shoulders and back muscles are treated with a deep tissue, powerful massage jet action. Adjustable hot tub jets beneath the soft pillow headrests melt neck tension and minor backaches, often caused by daily stress. Thighs, hips, and feet are comforted with a variety of water motions and strengths. As most PDC Spas hot tub jets are interchangeable, the massage action can be entirely customized to deliver the best massage action for you. Each and every hot tub model by PDC Spas features unparalleled seating design comfort. The signature Recliner in several models, much like a Captains Chair, relaxes the entire body from neck to feet. Lounges for the tallest to the smallest of users cradle with just the right back support and knee angle to enhance your hot tub time. Contoured buckets, deep bench seats, wide open corner seats, and armrests make any one of the PDC Spas hot tub models perfect for you. The youngsters and aging couples alike recognize the natural benefits of a warm water soak. From splashing to water games to the deep tissue massage and joint pain relief, a hot tub or swim spa adds a new dimension of pleasure to your lifestyle. Take a moment for yourself, feel better, sleep better, have that long awaited conversation there never seems to be the right moment for. You may discover this is the best investment you have ever made for yourself and yours. Relaxing in a hot tub, enjoying the natural effects of warm water hydrotherapy, offers endless benefits to the body and spirit. Lay down the phone, turn off the TV and take a few moments just for you. Step in and settle back letting the warmth surround you. Relax, as the stress and tension of the day fade away. A PDC Spas hot tub is like a vacation at home, always warm and ready for your relaxation. HOT TUBS, FOR THE RELAXATION YOU DESERVE. Prepare to experience a lifetime of health and wellness benefits with a PDC Spas hot tub. Combining comfort features and performance technology, every seat in your spa provides advanced hydrotherapy to improve your well-being. Sensibly placed hydromassage jets deliver a warm water massage to tense muscles, lowering blood pressure and reducing stress. Relieve joint pain and muscles aches at home as you relax with oxygen bubble therapy or spend quality time with loved ones reconnecting. 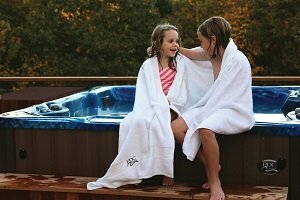 No matter your reason, PDC Spas hot tub collection offers a variety of model sizes, lounge seat styles and luxury features to perfectly fit your home and lifestyle.